Blog Blogroll Chelsea Transfer: Frustrated star heading back to Germany? Chelsea Transfer: Frustrated star heading back to Germany? Here at Soccerlens, we have followed the growing Kevin De Bruyne transfer saga with great interest. Now, following reports that the Chelsea winger is considering a January move away from Stamford Bridge, it seems that former loan club, Werder Bremen have jumped to the top of the queue for the 22-year-old. German newspaper, Bild, have claimed that the out-of-favour star is set on a mid-season exit from the club, and could be heading back to Bremen in January. Following Belgium’s 2-0 loss to Columbia on Friday, De Bruyne let his frustrations be known. In an interview with Belgium newspaper SportWereld, the Chelsea attacking midfielder said that he was unhappy with his performance for Belgium and blamed lack of regular game time at Chelsea for it. De Bruyne has only played 144 minutes of competitive football under new boss Jose Mourinho, with the Portuguese deciding to utilise a whole host of other talents in the wide berths for the Blues. The Chelsea boss was reportedly booed during his viewing of Friday’s Belgium loss, as the local fans feel that their star is being unfairly treated at Chelsea. 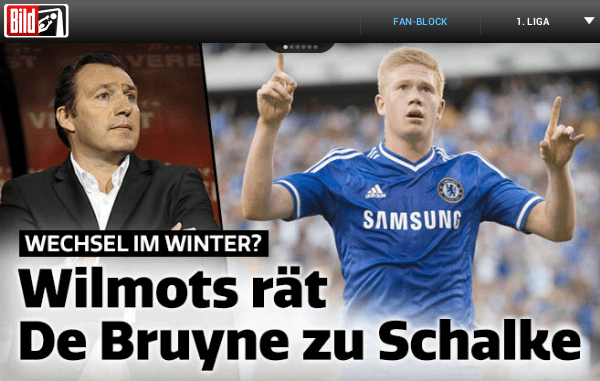 While Belgium coach, Marc Wilmots had previously indicated that De Bruyne would be a good fit at his former club, Schalke 04; it seems that De Bruyne’s previous links at Werder Bremen could be telling as we approach the transfer window.